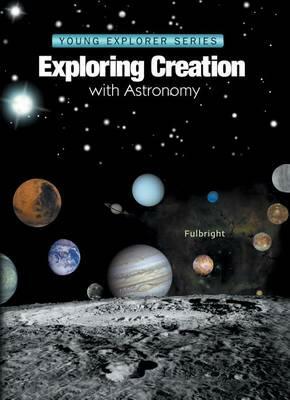 This book begins with a lesson on the nature of astronomy, and then it covers the major structures of our solar system. Starting with the sun and working towards Pluto, the student will learn details about all nine planets (or is it eight? - your student will have to decide) in the solar system. Along the way, the student will also learn about Earth's moon, the asteroid belt, and the Kuiper belt. After that, the student will move outside our solar system and learn about the stars and galaxies that make up God's incredible universe. Finally, the student will learn about space travel and what it takes to be an astronaut! The activities and projects use easy-to-find household items and truly make the lessons come alive! They include making a solar eclipse, simulating the use of radar to determine a hidden landscape, and making a telescope. We recommend that you spend the entire school year covering this book, devoting approximately two sessions per week to the course. I'm the host and executive producer of By the Book Radio, a weekly internet program for Christian living. I'm also a homeschooling mom, and just completed a study with my 9-year-old son on astronomy using your wonderful curriculum! It is by far the best science book out there for his age group, especially since he's advanced in science. -- Host and Executive Producer "By the Book Radio"